When I was sixteen, it was simple. Poetry existed; therefore it could be written; and nobody had told me — yet — the many, many reasons why it could not be written by me. I've been writing poems for the peace poem postcard project (a poem a day in February) and I've noticed some things about myself. One is that I don't want to send anybody a poem I don't like, which is a lot of pressure (impossible??) for that many poems. The second is that I can't handwrite a poem on a postcard for anything. My lines are too long and I wind up changing my line breaks. Even though my handwriting is pretty neat, I wind up worrying about the poems' readability. I've been printing my poems and then gluing them on the postcards because I can have longer poems that way. I need to tap into my short poem self, which has been fairly elusive thus far. 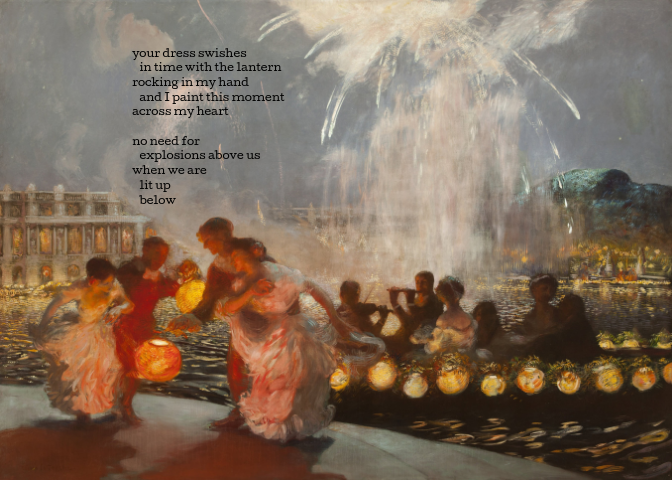 I wrote this short ekprastic poem based on Gaston La Touche's The Joyous Festival and then was like, ack, it's not peace-themed! Ah well, at least I can share it with y'all! I can tell you that once upon a time when I was doing public events people would ask me, "What do you think about the arts?, What do you think of the role of women?, What do you think of men?, What do you think of all of these things? ", and now they ask one thing, and that one thing is this, "Is there hope?" The answer, of course, is yes. Always yes. splits & doubles & speaks/the truth" maybe always & only the poet's truth? Thanks, Tabatha, you always make me think, then think again. First: how wonderful that there is a real person named Gaston La Touche. Thanks for lighting us up with Atwood, and I really love that Naomi SN story from yesterday. Your postcard poem is just beautiful- and so perfect for peace, love, and Valentine's Day. The poem you wrote, it brought that painting alive. It was treat, all of it. Thanks for sharing. Love your postcard poem, so beautiful! Thanks, too, for the Atwood quotes and poem -- she's quite a challenging poet to study and understand. I love your postcard poem, Tabatha - there is peace in light and joy, after all. I find that I need to ruminate over Atwood's poems before their meaning and intention become clear, I'd love to be in that classroom as your daughter and her classmates discuss Atwood! Your peace postcard poem is lovely, Tabatha. I also enjoyed reading the Atwood quotes. Thank you! I agree with others that your poem is indeed a peace poem. Yes to hope! I find Atwood so challenging and interesting -- I need to sit with that poem a bit. omg, Tabatha, you silly. Of course you've written a peace poem. And, the thought of you not being able to do exactly what you want to do with words....well, that makes me laugh because its just not possible in my imagination. I love that you and Elena discussed this poem. I love that somewhere young people are wiping the marrow of Atwood from their fingers. Lovely image and poem Tabatha– It's "lit up" and glowing too! What a power-packed poem from Margaret Atwood-lots to think about and ponder on there… And to her last question, Yes there must be hope! Thanks for all Tabatha. I agree with Heidi. I think your postcard poem is FULL of peace. I would definitely include it. And I'm blown away by the Atwood poem. I will come back to it later today and tomorrow and the next day. I just sent it to my daughter. Your postcard poem is gorgeous and I agree with what so many others said--it resonates with peace! The Atwood poem deserves much more than a cursory reading by me and I will come back to it later when I'm in that kind of space. Thank you for always sparking thoughts and ideas with your posts. I'll be honest. I didn't realize Margaret Atwood wrote poetry. Something new to explore! I think your postcard is peacefully perfect! I don't think I can say anything that hasn't already been said, but it bears repeating. Your postcard poem has peace written all over it. And thanks for the dip into Margaret Atwood. I can't tackle her books; I've never tried her poetry. Yes, there is hope as long as people keep writing poetry. Thanks for this wonderful, rich and simmering post, full of an overflowing of short poems. Here’s to hope, peace, and pondering! I also liked your poem as it flowed alongside the lanterns. What a beautiful poem for peace.